MINNEAPOLIS (AP) Minnesota Lynx star Maya Moore has decided to skip the upcoming WNBA season, seeking more time to devote to her family and her faith. Moore announced Tuesday on The Players' Tribune website that she'll sit out in 2019. She already had taken the fall and winter off from international competition. The five-time first-team All-WNBA honoree has helped the Lynx win four championships since her rookie year, 2011. "The success that I've been a part of in basketball truly blows my mind every time I think about it," Moore said in her post. "But the main way I measure success in life is something I don't often get to emphasize explicitly through pro ball." Raised by a single mother with strong Christian beliefs, Moore has spoken often about her desire for a well-rounded life steered by biblical principles . She quoted from scripture in her brief essay and, without citing specifics, said she plans to invest time in "some ministry dreams that have been stirring in my heart for many years." Reforming the justice system has been a particular passion of hers , including a personal interest she has taken in the case of Jonathan Irons , who was imprisoned in Missouri in 1997 by what his supporters contend was a wrongful burglary conviction at age 16. "I'm sure this year will be hard in ways that I don't even know yet, but it will also be rewarding in ways I've yet to see, too," Moore wrote. "I'm thankful to my Lynx family and others close to me who have been walking with me during this shift, and I'm excited to see what the future holds." Last season was only the second time since Moore was drafted first overall that the Lynx didn't reach the WNBA Finals. Moore was eighth in the league in minutes and seventh in points in 2018. She has missed one game in eight seasons, with career averages of 18.4 points and 5.9 rebounds per game. "We support her in this exploration and will continue to provide her the love and care she has always known from her Lynx family," general manager and head coach Cheryl Reeve said in a statement distributed by the team. Moore, who went to high school in the Atlanta area she now calls home, was given the franchise tag last month by the Lynx, preventing her from becoming a free agent. 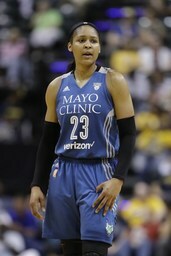 Hours before announcing her decision to sit out, Moore signed a contract with the Lynx on Tuesday. The 29-year-old, who won the WNBA Most Valuable Player award in 2014, expressed her fatigue - and her eagerness for some extended rest - near the end of the 2018 season, which saw the Lynx ousted in the first round of the playoffs. The league compressed the 34-game schedule by three weeks from the 2017 slate. Moore was the top vote-getter for the All-Star game last summer in Minnesota, but she passed on the team captain responsibility that would have required her to draft from the 22-player pool. Candace Parker of the Los Angeles Sparks took her place, joining Elena Delle Donne of the Washington Mystics in assembling the sides. Moore had 18 points, eight rebounds and six assists in the exhibition to earn her third straight All-Star Game MVP award. Moore also opted out of the Women's Basketball World Cup, the first major event she wasn't on the U.S. national team for since the 2008 Summer Olympics, which took place before the start of her sophomore season at powerhouse Connecticut. The Lynx, too, are in flux following the retirement of five-time All-Star point guard Lindsay Whalen, who became coach at her alma mater, Minnesota. They start their season May 25 against Chicago.